What Is a Merit Scholarship and How Can I Get One? Looking beyond pure financial need, a number of colleges and universities frequently offer aid to applicants who demonstrate remarkable talents or skill-sets. Whether it’s for outstanding standardized test scores, an excellent GPA or a marked accomplishment in an intended field of study, schools seek to reward successful students. This form of financial aid is typically referred to as a merit scholarship (or merit award). The criterion for a merit scholarship is usually determined by the individual school offering the award. And requirements will certainly vary depending on a school’s selectivity. Therefore, it’s quite possible that a particular student might be awarded a merit scholarship at one college but not another, since the respective candidate is being considered against different applicant pools. In other words, the more competitive a school is, the smaller your chances at winning a merit scholarship. Unfortunately, not all colleges offer such scholarships. Indeed, the vast majority of institutions that provide merit assistance are private. However, some state universities sponsor honors and/or scholars programs and those often include financial aid benefits. To find out if a specific college doles out merit scholarships, review the financial aid information included on their website and within their admission publications. How do colleges determine who receives a scholarship? A college interview (if required). How do I best position myself to earn a merit scholarship? To begin with, you should take a rigorous course-load. Don’t convince yourself that you’ll be better off if you simply earn higher grades in easier classes. Instead, challenge yourself to enroll in advanced placement and/or honors classes if they are available (and you qualify for them). Additionally, you should aim to achieve high scores on either the SAT or the ACT. This will likely mean engaging in some form of test preparation and perhaps taking the exams more than once. It’s common for students to see an increase in their scores from each successive sitting. This is due in part to the fact that they become more familiar with the format of the questions and more comfortable with the testing procedures. 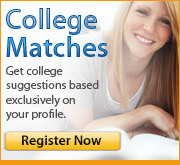 Finally, be strategic in your college search. You want to find schools that will be a great match for your abilities, needs and interests. It’s important to have a list of colleges that are not only competitive but in which you’ll be a competitive applicant. As we noted above, your chances of winning a merit scholarship will be diminished if you only apply to the most selective colleges in the country. Of course, you shouldn’t discount yourself because something is more difficult. The goal is to strike a balance and find schools that will meet your academic, social and financial needs. We know it feels like a tall order but it’s certainly possible!